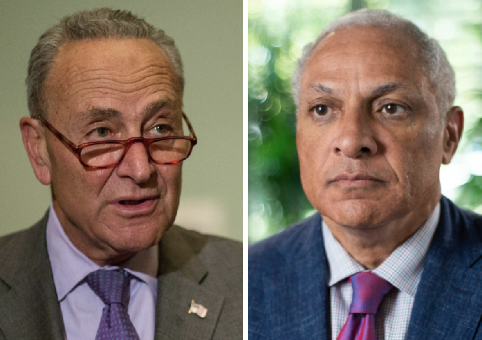 A super PAC linked to Senate minority leader Chuck Schumer (D., N.Y.) is making a last-minute investment in Mississippi to bolster Mike Espy, the Democratic Party's nominee for U.S. Senate, ahead of the Nov. 27 special election runoff. Senate Majority PAC, which is run by a noted Schumer confidant and committed to boosting Democrats in the upper chamber, made its first and to-date only ad buy in Mississippi on Thursday—totaling more than $507,000, according to documents filed with the Federal Elections Commission. A staff member for the Schumer-aligned super PAC told the Washington Free Beacon the total expenditure would be spent on launching an ad attacking incumbent Republican senator Cindy Hyde-Smith for accepting campaign donations from the insurance industry. The ad, which is similar in style and tone to attacks the PAC leveled against other Republican Senate candidates this election cycle, will run statewide across Mississippi's media markets. It fails, however, to note that Espy himself has accepted more than $55,000 from individuals affiliated with the health care industry. It is unclear if the ad will continue running through Nov. 27. Senate Majority PAC did not respond to follow-up requests. The investment comes on the heels of the Nov. 6 special election held to determine who will fill the remainder of former Republican senator Thad Cochran's term, which is scheduled to end in 2020. Espy, who previously served in the Clinton administration as secretary of agriculture before resigning under a cloud of ethical and financial impropriety, took second place in the special election with more than 40 percent of the vote. The Democrat was only two points behind Hyde-Smith, who was appointed upon Cochran's retirement in March. Another Republican candidate, state senator Chris McDaniel, came in third with slightly more than 16 percent. Since no candidate received more than 50 percent of the vote, a runoff between Hyde-Smith and Espy has been scheduled for later this month. The scale of the buy seems to indicate that National Democrats aren't taking the race lightly, especially after watching Senate incumbents suffer bruising losses in Indiana, Florida, North Dakota, and Missouri. Espy's second-place showing and the prospect that electoral turnout will be significantly lower in the run-off than it was on Election Day seems to have ignited Democratic hopes of snagging another Senate seat in the deep South. As previously reported by the Free Beacon, Espy raised more than $250,000 in the week after the special election in part due to a flood of campaign contributions from the legal and entertainment professions aligned with the Democratic Party. Jennifer Dunagin, communications director for the Mississippi Republican Party, told the Free Beacon it wasn't surprising Senate Majority PAC was committing resources to the race. "Out-of-state liberals are pouring in hundreds of thousands of dollars into Mike Espy’s campaign for one reason: They know he would be a guaranteed vote for their … agenda," Dunagin said. "Mississippi deserves a senator who will stand up for their values, not someone who will stand up for Chuck Schumer's." The ad buy was conducted through Waterfront Strategies, a Democratic media placement firm that holds Senate Majority PAC as one of its top clients. The firm is run by Jim Margolis, a former senior campaign adviser to President Barack Obama and ex-Secretary of State Hillary Clinton. As denoted by the Center for Responsive Politics, Senate Majority PAC spent $114 million underwriting Democratic Senate candidates this cycle alone. Disclosures show that Waterfront Strategies was the PAC's single biggest vendor accounting for more than $28 million in payments. This entry was posted in Politics and tagged 2018 Election, Chuck Schumer, Mike Espy, Mississippi, Senate Democrats, Super PACs. Bookmark the permalink.